Selection of the correct StockMaster model and size for your task requires a knowledge of both the operating environment and the application. Read the Operating Environment and Application data below and then choose your size from the chart at the end of this page. The following information is a guide. For further help, consult your dealer. Lift-Truk requires a smooth and level surface for operation. In the mobile mode, the feet of Lift-Truk clear the operating surface by approximately 20 millimetres. A typical concrete slab floor provides a suitable operating surface, however areas around sumps, drains or other variations in level exceeding 20 millimetres will not permit correct operation. To ensure clearance of the operating surface check the area to be used. Lift-Truk has good manoeuvrability and may be used in confined spaces. Height of doorways and overhead fixtures. Space for turning at the end of storage bays. Space for and movement in aisles and between machinery and fixtures. 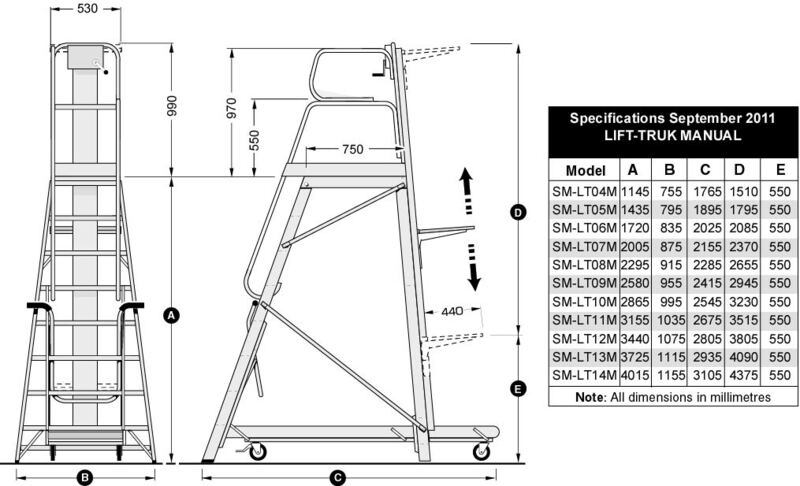 Lift-Truk is principally designed for this application and can be moved in any direction to maximise the speed of relocation between fixtures. The maximum recommended storage height for an item is dependant on the item weight and the working range of the selected size. 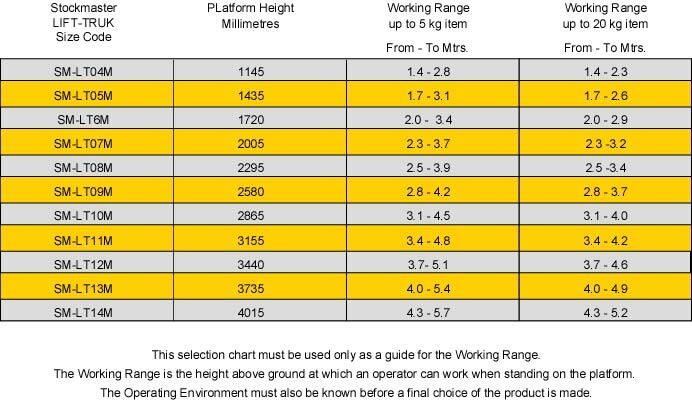 (See chart below) The maximum load rating is 60 kg. If the Operating Surface is poor, StockMaster Tracker can be suitable dependant on the available Operating Space and the size and weight of items to be handled. This application is generally best serviced by Stockmaster Tracker, however subject to a good quality Operating Surface the lifting capability of LIFT-TRUK can solve the problem of placement of heavy items.